Elkanah Watson was born in 22 Jan 1758 in Plymouth, Massachusetts, a descendent of Mayflower Pilgrims from 1623. The year after the burning of the Gaspee, which was led by John Brown, Elkanah Watson was apprenticed to the prominent Providence merchant in 1773. After the adventures described below, Elkanah went on to become a trusted courier amongst such notables as George Washington and Benjamin Franklin. He wrote extensively about his travels in America and Europe during the time of the Revolution with particular interest in canal infrastructure, and became a prominent merchant in France. 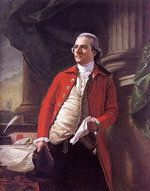 After winning a lottery in Europe he commissioned the famous artist, Copley to paint his portrait. When this painting was displayed in England in the 1790s it was the first depiction of the American flag allowed on British territory (note the flag flying on the ship-of-war in the background). After the Revolution, Watson spent some time in North Carolina, then moved to Albany, New York. There he became a successful businessman, founded the Bank of Albany, and became the chief promoter of the Erie Canal project. We note also that he bought and developed some land in Cortland County, and curiously, along with several Gaspee raiders, may have been involved in land speculation along the proposed route of the Erie Canal. In his later life, Elkanah Watson purchased a farm in the eastern Albany suburb of Pittsfield, Massachusetts where he developed and promoted the idea of the agricultural fairs. He is now acknowledged as the 'Father of County and State Fairs'. From the Brown Family Genealogical Society - Vol 25, Issue 2 (December 1996) Page 17. At the age of fifteen, in Sept., 1773, Elkanah Watson left Plymouth for Providence, to become an apprentice with John Brown, a benefactor of Brown University, and then one of the most enterprising merchants in our country. In that year the tea was destroyed at Boston, and the difficulties with England were assuming a very serious aspect. The young men of Providence formed themselves into military associations, and often met to drill. He enrolled himself in the Cadet company [...]. The mind of young Watson was fixed upon entering the army, but application to his father and to Mr. Brown, to be released from his indentures, were in vain. Mr. Brown, finding the army almost destitute of every munition of war, particularly of powder, directed the captains of his vessels on their return voyages, to freight with that article, and when the army at Boston had not four rounds to a man, most fortunately, one of Mr. Brown's ships brought in a ton and a half of powder, and it was immediately forwarded under the charge of young Watson to Cambridge, attended by six or eight recruits to guard it. Mr. Watson says: "I delivered my letter to Gen. Washington in person, and was deeply impressed with an emotion I cannot describe in contemplating that great man, his majestic mien, his dignified and commanding deportment." Soon after this, Mr. Brown having contracted to supply the army of Washington with flour, sailed for Providence with a cargo from Newport. This vessel was seized, and Mr. Brown was himself made a prisoner and was sent to Boston in irons, charged with heading a party, in 1772, which burned his majesty's schooner Gaspo'e, in Providence river. The whole community was indignant and exasperated at his seizure. A consultation was held immediately and it was decided to send an express to Plymouth in order to fit out two armed schooners to intercept, if possible, the captured flour vessel, in her passage round Cape Cod, and release Mr. Brown. Watson was entrusted with that important mission, and with his musket at his back, on a fleet horse, be arrived at Plymouth at two o'clock in the morning, alarmed the town with the cry of fire, and aroused up the committee of safety. At sunrise he was awakened by the beat of the drum to muster volunteers for the enterprise. By two o'clock the same day, he with sixty to eighty others embarked on board two dilapidated fishing schooners equipped with two old cannon each, and with powder loose in barrels. They sailed reckless of consequences, determined to secure Mr. Brown. They had no commission, and had they been captured, would probably have been hung as pirates with little formality. They cruised ten days east of Cape Cod without success, and being pressed by a twenty gun ship, finally escaped into Plymouth. Thus young Watson sailed at the age of seventeen from the place of his nativity, in probably the first vessel that opposed the British flag, and but a few rods from the rock upon which our forefathers landed, one hundred and fifty-five years before, in the assertion of that liberty which was then bravely defended by their descendants. Mr. Brown was soon after released through the interposition of his brother, Moses Brown, the conspicuous and eminent Quaker of Providence. 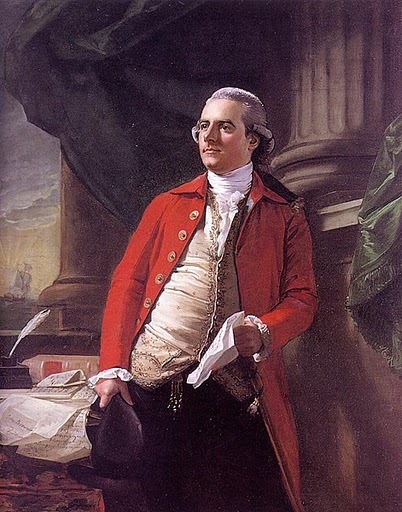 The commerce of Providence was prostrated by the war, and in August, 1777, Mr. Brown and his brother Nicholas proposed to Mr. Watson to take cargo of about fifty thousand dollars to carry on horseback to South Carolina, and deposit in the hands of agents for investment in cargoes for European markets [...]. More commentary from the Webmaster of Gaspee Virtual Archives: Had this plan to rescue John Brown succeeded in actually intercepting the British ships, the first shot of the American Revolution could have very well been fired at sea off Cape Cod, and possibly before April 19th. It is quite probable that the crews from Plymouth would have been handily defeated. But this incident certainly points out that war was inevitable from various points of view throughout New England, not just at Lexington and Concord. Charles Rappleye in his new book Sons of Providence: The Brown Brothers, the Slave Trade, and the Revolution (Simon & Schuster, 2006), gives an excellent retelling of Moses Brown's mission to rescue John Brown once John had been imprisoned in Boston..